If you were to establish an arena or crucible, fill that receptacle with individuals who had agendas, you'd be on your way to the orchestration of an outcome. Say the crucible were a stock pot of the sort used in restaurants to boil lobsters. Say further that you filled such a stock pot with water, put the pot on a burner, turned on the flame, then introduced a lobster. You'd be on your way to an outcome. In time, the outcome would become an event. Like outcomes, events may be planned, accidental, random. By the definitions of their nature and participants, some events are one-time, while others are periodic, yes, even regular. The greater the likelihood of an event occurring, the higher the probability the event will be called sporadic. In most cases, the lobster in the pot would become an outcome, an event appearing on some expectant diner's dinner plate. The lobster may have intellect of the sort that will allow it to escape its intended outcome of lobster dinner. Even the persons who'd been willing to pay upwards of thirty dollars for that lobster dinner would root for the lobster in its escape mode because--well, because many of us tend to root from persons, animals, even insects who have managed to escape from an outcome so clearly against their interests as the lobster of your imagination is in its potential escape from the sea food special dinner. 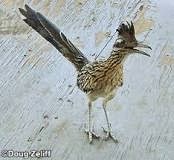 You have nothing but admiration for the cartoon character called The Roadrunner, who is a stylized Geococcxyx californicus, a swift, clever, adaptable bird of the high desert. If it were not for Wile E. Coyote, you would root for The Road Runner in the multifarious attempts made by The Coyote to secure him for dinner. You instead root for Wile E. Coyote, each time he sets of on the quixotic pursuit to best The Road Runner, to turn him into the high desert equivalent of the sea food special dinner. In what is a major psychological and dramatic turn of events, you are rooting for a character who is fated always to lose. In a real sense, if you've seen one of the Wile E. Coyote-Roadrunner cartoons, you've seen them all. The results are always the same. The Roadrunner always wins. Wile E. Coyote always loses, is always humiliated. Anyone with the slightest background in story would understand that the story would end if Coyote were to capture Roadrunner. You have no idea when the cartoon was last produced. You're guessing there has been no new issue this century, thus going on fourteen years. Nevertheless, you find some new pleasure, some incandescent pleasure in watching some of the old events on You Tube, all the while knowing for a certainty that The Coyote will not prevail. On a scale of one to ten, with one being lowest and ten at the other end, you are perhaps a minus one on the spectrum of masochism. You do not like to see things become humiliated. But you do not watch Wile E. Coyote to see his humiliation. Rather, you enjoy his unflagging devotion to his chosen task. He has stolen the scene from Sisyphus, who in his way has been every bit as humbled through the years of our culture by his own humiliating task. Because you were fortunate enough to know of your Wile E. Coyote tendencies well before there ever was a Wile E. Coyote, you somehow found your way into publication enough times so that you were able not to be put off by it or the changes publication had on your life. The fact of your movement from writer/submitter of materials to editor/acquirer of the work of others has also placed a cooling hand on the brow of your impatience. True enough, there were times when you tired of being the instrument of helping another individual to find her or his way to publication, wishing instead to apply additional efforts to your own publications career. But all that did in the long run was cause you to put additional measures of intensity in the things you wrote, understanding by then that story was essential, characters important, dialogue vital, yet the greater essential was and is intensity. If the outcome is not intense, you have not been in full attendance. You are less apt to imitate Wile E. Coyote in your chase, which carries you, in your intensity, over the edge of a mesa, with nothing to anchor him. He scurries, pinwheels his hind legs, then allows a recognizable look of here-we-go-again to enter his face, moments before he begins his plummet downward to the desert floor. A short while ago, abstracted after a break in class, you returned to what you thought was the proper classroom, approached the desk, then paused, on the point of starting a discussion. These students did not seem at all familiar. Because your mind was elsewhere, you'd entered the wrong class room. There is, in your vision, a plenitude of disconnect in the world and in your stories. This may be due to the catch-all concept of absent mindedness, which indeed is a code word for having one's mind somewhere else, pursuing other events and outcomes. It may also be your default setting. Much of the time, when you are not watching Wile E. Coyote reruns on YouTube or reading books, you are focused on extracting events and their potential outcomes from the chaos about you that has become your version of Wile E. Coyote's southwest, with its mesas, gorges, buttes, and hardscrabble desert. There will be more over-running of mesas, more erroneously entered classrooms, and more intensified attempts than ever to pursue the illusive events of story and understanding you seek.